Custodian Cliff Williams passed away on Sept. 9 in his sleep. Williams, commonly known as Cliffy, worked at South for 15 years in the Maintenance Department. The school held a memorial in his honor on Sept. 15 in the Lyceum, inviting all of the faculty to join in remembering Williams. Principal Dr. Lauren Fagel spoke at the memorial, recalling Williams’ character and telling stories from his co-workers. Bill Williams, Cliff’s younger brother and co-worker, says his brother was someone with exceptional character. Cliff’s supervisor, Aneta Mistak, also mentioned his kindness towards everyone, especially the women in the department. Custodian Daisy Demeas says she was welcomed back from her vacation with Cliff greeting her happily. In a Facebook post custodian Rick Foster wrote after finding out about Cliff passing, he recalled the first time he came to work at South and the positive relationship he formed with Cliff. Cliff was also a very thoughtful person, as he would think of the crew members wherever he was, custodian John Holmblad says. 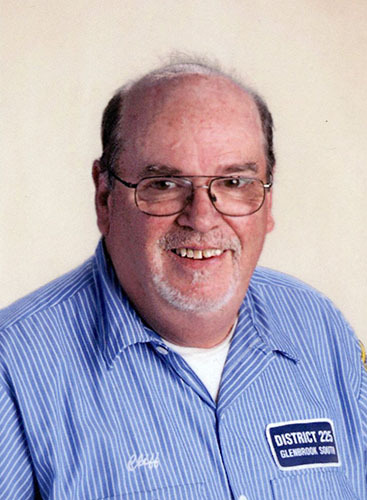 Just as Cliff was attentive towards his co-workers, his co-workers would also think about him as they cleaned the school and would often bring discarded items to put into his locker such as trophies and Cliff bar wrappers. Holmblad says that ever since Cliff passed, the department has been sharing memories about him and reminiscing in the moments they created together. One specific memory Holmblad remembers was the department’s habit of teasing Williams for his fervent love for sausage pizza. Mistak’s best memory of Cliff was the special goodnight he would say over the radio whenever she or someone else said they were leaving for the night. Because of his childlike and youthful nature, Mistak says it came as a shock for many in the department when they heard about Cliff passing. Bill also says the sudden passing of his brother surprised many in their family as well, which is partly why it was more difficult for him and the family to accept. Holmblad also says he was stunned to find that Cliff had passed away because of how strong and healthy he was everyday. With his positive, compassionate and considerate personality, Cliff will be dearly missed at South, which Mistak says was a special place for him.